HERE is a Google Map you can download to find those places more efficiently! Alexela Concert Hall was opened to the public in 2009. With a capacity of 1829 seats, it is equipped to host performances with various technical requirements. The corner tower and facade on the Rävala Street side are the only remnants of what used to be a centre for Soviet ideology, which was built in 1985. 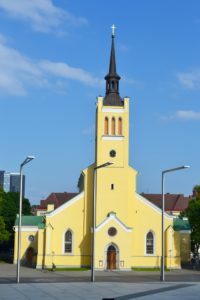 Completed in 1870, Charles’s Church is a rare example of neo-Roman architecture in Estonia. 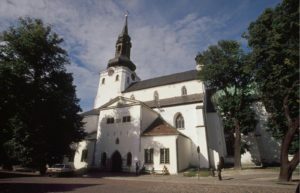 The current church occupies a site on which the Swedish king Carl XI built a church in the 1670s, and has become a monument of Estonian national self-awareness. Its fresco, by Johan Köhler, is the first example of monumental painting in Estonian art history. 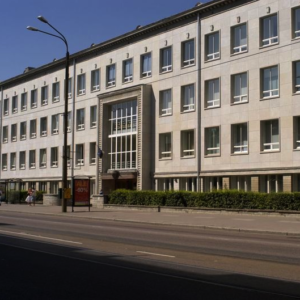 This building dates from 1940, distinguishable by its facade of Finnish granite. Though initially built to be the parish house of Charles’s Church, it served this purpose only briefly before it was nationalised and turned into offices of the Soviet Army. During the Second World War it housed the police and special services. Today the parish conducts all its educational work here. This historic building was originally a boiler house for a power plant. Its 700-square-metre boiler room still contains two giant boilers. Today, it is operated by the Tallinn Creative Hub as a multifunctional event centre. 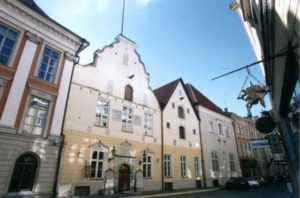 The Tallinn Higher Music School, which is considered to be the predecessor of the current EAMT was established by the Music Department of the ‘Estonia’ Society, with the opening ceremony taking place on September 28, 1919. Today EAMT is an internationally competitive learning and research facility with a building dating from 1999. As of now, it is one of the best and most modern conservatoire buildings in the world, especially with respect to its functionality and technological solutions. 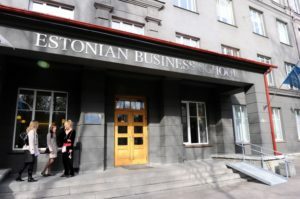 Founded in 1988, now with campuses in both Tallinn and Helsinki, the Estonian Business School was the first Soviet institution to offer English-language business education. 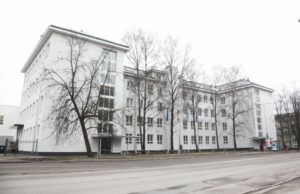 The school has been based here since 1996, in a building that was originally erected for the Tallinn Light Industry Technical School in 1956. 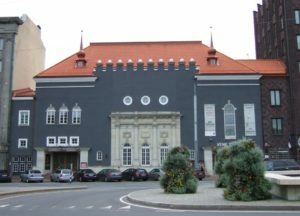 The Estonia Concert Hall forms part of the the neoclassical Estonian Theatre building, which was completed in 1913. The building was destroyed during a bomb raid in March 1944, being subsequently restored in 1946. The 889-seat hall serves both as a concert hall and reception hall, for occasions including state visits and the annual Presidential Reception. 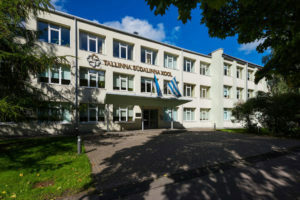 This typical 1960s school building is home to a school that, in addition to the Estonian curriculum, also offers intensive German language study. Throughout its history, the school maintained close relations with the Federal Republic of Germany, even in the closed environment of the Soviet regime. This is a perfect opportunity to peek into a modernist office building from 1982. Originally hosting a major technical design company, it has been subdivided into commercial, office and conference spaces. This school—the oldest in Estonia—was founded by the Swedish authorities in 1631. 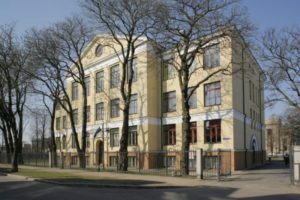 The primary school building, typical of the Stalinist architecture of the 1950s, is located in Tallinn’s oldest suburb Kalamaja, which was originally a fishing village. The Hopners’ House highlights the development of domestic architecture in Tallinn across six centuries. As a medieval merchant’s house, it served as both a home and warehouse. The first ownership deeds date from 1352, but the current interior originates mainly from the 1680s. The concert hall is located in what was the attic. The House of the Blackheads is the former headquarters of a professional association of shipowners, merchants and foreigners, founded in the 14th century. The so-called White Hall was completed in 1532, and is one of the oldest rooms in Tallinn. 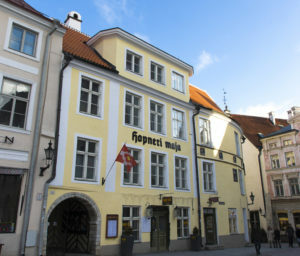 Built to host entertainments, it is one of the first Renaissance-style chambers in the Baltic states. The hall acquired its present layout during renovations between 1909-1911. With its grandiose rooms, this building, completed in 1940, was unusually architecturally ambitious for its time. It is now home to one of the few high schools offering a specialist musical education. Increasing industrial activity at the beginning of the 20th century saw a rapid rise in the population of the Kopli peninsula. This neoclassical building was built in 1915, to host a school for workers’ families. The house was first registered in 1879 as the property of the German Baron von Glehn. With the independence of Estonia in 1919, it subsequently became a meeting place for businessmen. During the subsequent periods of occupation, it was employed as political offices. Today, the house is a centre for young people, hosting recreational education classes. 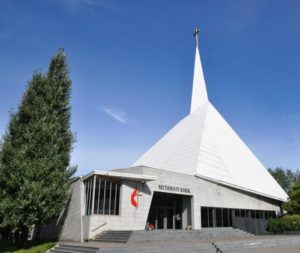 Constructed in 2000, this is one of the largest modern churches in Estonia. With its wonderful acoustics and a capacity of 600 seats, it is a popular concert venue. 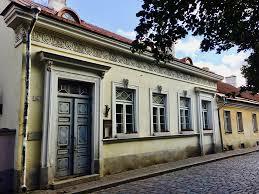 All the buildings in Uus street 16 date from 1810, and were designed by the German-Finnish architect Carl Ludvig Engel. It has subsequently housed a pharmacy, a retirement home for the noble ladies of the Kanuti Guild, and since 1986, classes in art and music education. Pelgulinn Community Centre was founded in 1948, but only moved to its present location in 1957. Constructed in 1931, the building was initially a Seventh-day Adventist church. 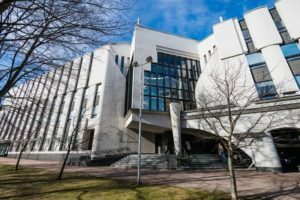 In the intervening years, it was nationalised and housed Tallinn’s Central Library. This modern seven-storey building attempts to bring together offices, apartments and recreational space. In addition to its many activities for younger people, Raavis is especially proud of its programme of events for the elderly. One of the finest examples of neoclassical architecture in Tallinn, this building was erected in the 1950s as a base for Russian naval officers. Originally, it boasted a light design from Moscow and a 1100-seat theatre—the largest in the country. Today, it hosts a collection of naval war paintings and a round-painted ceiling. 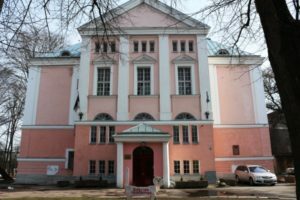 At the restoration of Estonian independence, it became the Russian Culture Centre. Salme Cultural Centre was built in 1965 as a cultural club. 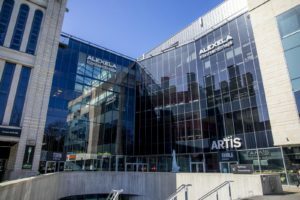 Home to more than forty activity groups and a busy schedule of concerts and other entertainments, today it is one of Tallinn’s largest cultural venues. While the first song celebration took place in Tartu (1869), the growing interest and popularity meant that the festival soon needed a place to call its own. 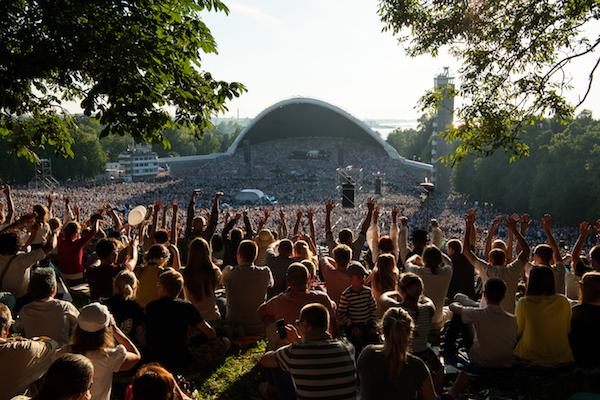 From 1928 onwards the home of the much-loved festival has been the Tallinn Song Festival Grounds in the midst of the scenic pine grove on the coast of Tallinn. The current stage – the unique “seashell” arch was built in 1960 and was used as a model for the Soung Festival Grounds for Riga and Vilnius. The designers took into account the nature of the land the stage is going to be built on: audiences would be seated on the slope of the hill, so the song arch would need to echo sound to them. Up to 34 000 singers have sung under the song arch, which was constructed for 15 000 singers and in front of it around 300 000 people (a third of the population of Estonia!) have stood side by side to sing. The Song Festival Grounds are a symbol of freedom and holds a special place in Estonian’s hearts. Very little remains of what used to be the largest church in medieval Northern Europe, after St Catherine’s Dominican Monastery was destroyed during the Reformation, by a fire in 1531. With its impressive portal and unique crypt, it functioned for a time as a warehouse, more recently being host to a variety of exhibitions, theatre performances and concerts. Situated just outside the historic city walls, St John’s Church was built between 1862-1867 for the city’s Estonian-speaking congregation. 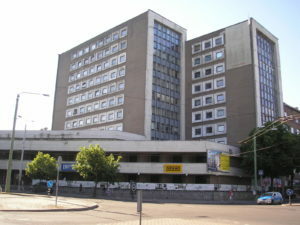 Since the 1930s, this neo-Gothic building faced several threats of demolition, deemed as being out of keeping with the dominant Art Deco style. The Domus Marians was first mentioned 1219, in relation to the German crusades and the Danish kings of Old Livonia. 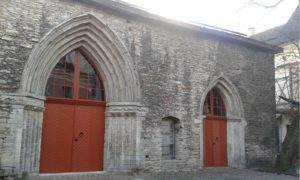 It was formerly the principal church of the Estonian domains of the Danish King Valdemar II. The current building dates from around 1230. On its walls are large 17th and 18th-century epitaphs of Estonian knights. 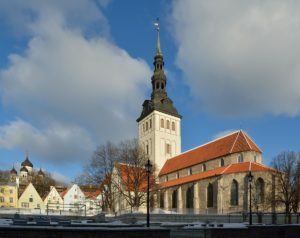 Founded in the 13th century, St Nicholas’s Church was one of the original two parish churches in medieval Tallinn. 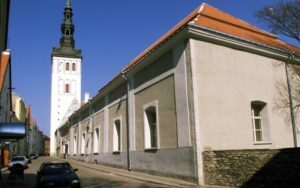 No longer a functioning church, it is now part of the Estonian Art Museum, and its collection evidences the glory and prosperity of the Hanseatic era. Although only a fraction of its riches survives, its collection includes Bernt Notke’s Danse Macabre, the magnificent retable of the high altar from the workshop of Hermen Rode, and a seven-armed brass candelabrum almost four metres high. 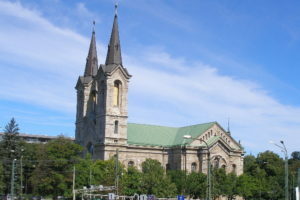 St Olaf’s church was named after the Norwegian King Olav II Haraldsson. The church is first mentioned in 1267, but was probably built sometime in the 12th century. This Gothic church is the tallest church in the Baltic countries, and was in fact the tallest building in the world between 1549 and 1625. Completed in 1532, St Michael’s was originally an almshouse for the city’s poor. In 1733, the tsarist Russian government donated it to the Swedish congregation. Under the Soviet occupation, it was turned into a sports hall in 1949. However, following the state visit of the Swedish Royal family in 1992, the building was returned to the Swedish congregation. This building was constructed in 1895 for the Russian Community Club, to host private events for Tallinn’s Russian elite. 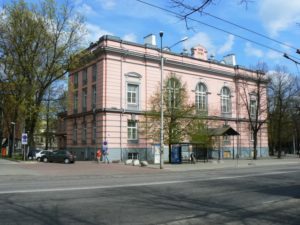 Since the 1920s, it has been Tallinn’s Central Library, and is open to anyone with an Estonian ID- or residence permit card. The first governmental Russian speaking school was founded in 1923 and today runs in two separate buildings. The so-called Lender’s House dates from 1935. With its classrooms built around an elegant glass tower and evacuation staircase, it is a perfect example of architectural functionalism. Built in 1938, this school was praised as the most modern school building of its time. In the Second World War, it was used as a military hospital. 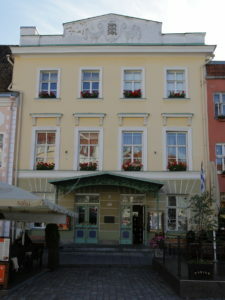 This historical building was constructed in 1914 as the Tallinn Commercial Gymnasium for Girls. 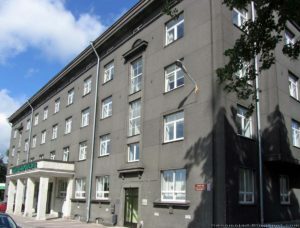 During the Soviet period, it housed Tallinn Nautical School. 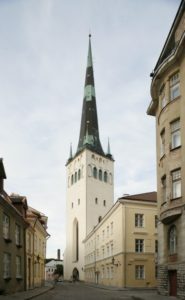 Since 1996, it has been home to Tallinn English College, the oldest English Language immersion school in Estonia. 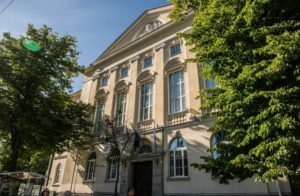 Georg Ots Tallinn Music College is a national vocational education institution with a list of notable alumni, including Arvo Pärt, Eri Klas and Neeme Järvi. 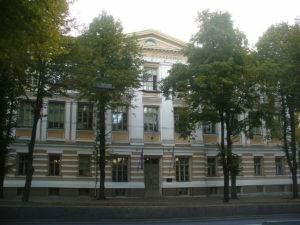 The college grew out of the Tallinn Higher Music School, which was established in 1919. While it was initially focused only on classical music, since 1977 it has also offered courses in popular music. The school was founded in 1881, with the main building being constructed in 1884. From the beginning, the curriculum emphasised science-related subjects. The ‘Realists’, as its students were called, played an important role in the Estonian independence movement. A large number volunteered as soldiers in the War of Independence. In 1927, a memorial—now known as ‘The Boy’—was erected in the honour of the teachers and students who gave their lives. During its 100-year history this school has operated in several locations, with classes of various sizes and ethnic background. This school is an example of 1960s model architecture for schools and was purpose built to host this institution. 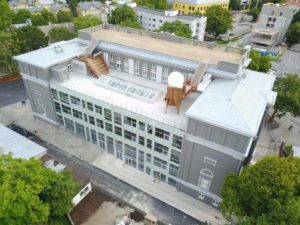 The school was founded at the end of the 18th century as a two-class school, being named Imperator Jekaterina II Reval Elementary School on its 100th anniversary in 1899. 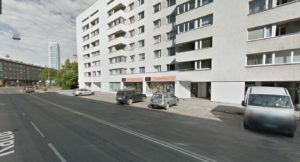 Today, it is one of Tallinn’s Russian schools. 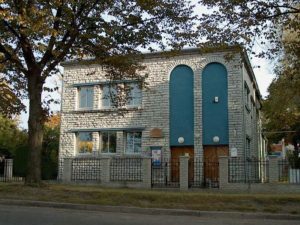 The building is an example of the early limestone-functionalism, which became prevalent in Estonian architecture in the 1930s. Despite its many years serving as a school, it has miraculously retained its original windows, doors and staircases. 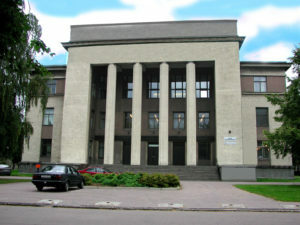 Tallinn University is Estonia’s largest university focused on the humanities. Founded in 1919 as the Tallinn Teachers’ Seminar, it remains the country’s leading institution for teacher training. 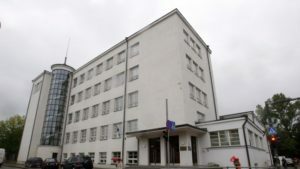 The main building, designed by Erika Nõva, the first prominent Estonian female architect, is a beautifully preserved example of the late-1930s Estonian style. 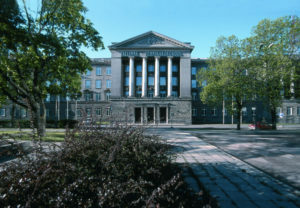 The history of the TTK University of Applied Sciences dates back to the 1920s. 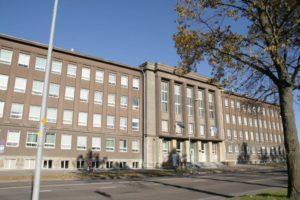 This historic building was constructed in 1952, and ever since has been host to one of Estonia’s leading institutions providing technical education. Operating for the last 60 years in a medieval building, Tallinn’s Teachers’ House—a cultural and educational centre—has only existed for a comparatively short time. From the 13th century onwards, the building was owned by various wealthy merchants and town council members. In 1766, the residential space was repurposed as ceremonial rooms for the Tsarist leaders. 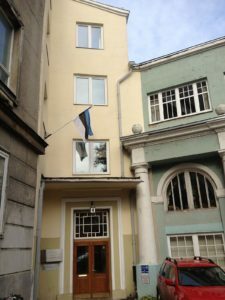 In 1918, it became the first office for the Provisional Government of the Republic of Estonia. The Russian Theatre, located by the Freedom square in Tallinn, is regarded as one of Scandinavia’s most beautiful theatres. 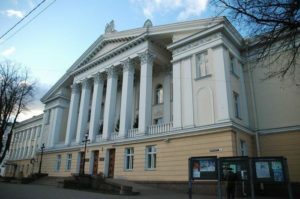 The theatre is the only professional Russian theatre in the country and the keeper of Russian thespian traditions in Estonia. It was constructed 1926 in the luxurious Art Deco style; the building, which was designed to be a cinema, housed the premier cinema of the First Republic, the Gloria Palace. 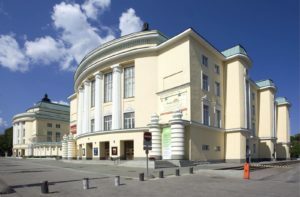 During the season of 2004/2006, the Russian Theater had undergone a general reconstruction, resulting in restoration of the historical image of the building’s interiors. At the same time, the theatre was turned into one of the most technically perfect theater venues. 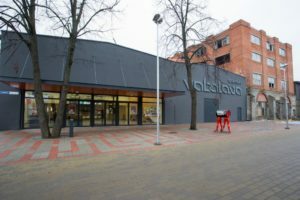 A theatre that welcomes all independent performing groups, Vaba Lava is housed in a former metal workshop of the Baltic Railway Factory. It operates as part of Telliskivi Creative City, and each year features some 600 events produced by 250 creative companies. 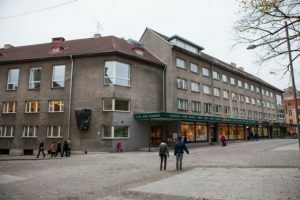 The Writers’ House with its offices for the Estonian Writers’ Union, a bookshop, a restaurant and apartments, but most importantly its Hall with a Black Ceiling has since its creation in 1963 been a buzzing and controversial centre of Estonian literary life.